OTTAWA, Canada -- The sister of a 33-year-old Ukrainian helicopter pilot who has been imprisoned for nearly a year in Russia is calling on Ottawa to press for her release amid reports that her health is deteriorating. 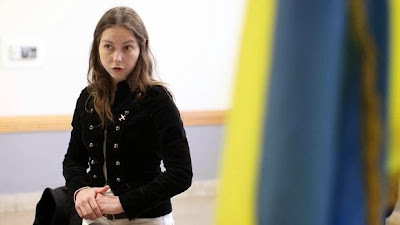 Vera Savchenko meets with local Canadian-Ukrainian at The Ukrainian Hall April 27, 2015 in Ottawa. Vera's sister Nadiya Savchenko, captured Ukrainian pilot whoís in prison in Russia. Vera is travelling around the world trying to convince Western governments to pressure Moscow to release her sister. Vira Savchenko met with parliamentarians, including the government’s junior foreign affairs minister, and members of Canada’s Ukrainian community during a two-day trip to Ottawa earlier this week. The visit was part of a global campaign organized by Vira and her mother, and aimed at drawing attention to Nadiya Savchenko’s plight. Nadiya, a lieutenant in Ukraine’s military, was captured last year by pro-Russia separatists while fighting with a volunteer battalion in Eastern Ukraine, her family says. She has been in Russian custody since June, 2014, and is charged with helping guide a mortar attack that killed two Russian state television journalists. Her family says Nadiya could not have had a role in the attack because she was already a prisoner when the two journalists were killed. Vira said cell phone records prove Nadiya was not in the area and could not have known the journalists were there. In a recent interview with The Globe and Mail, Vira said her sister’s health has worsened after multiple hunger strikes during her detention. Nadiya’s weight has dropped significantly, Vira said, making calls for her release increasingly urgent. “This is about the price of freedom, the price of fairness and justice,” Vira said through a translator. She said she believes her sister is less worried about her own health than she is about those issues. Media reports from Ukraine this week indicate that Nadiya may be transferred to a Moscow hospital. Nadiya became involved with a volunteer battalion because she was disappointed the Ukrainian military did not fight against the annexation of Crimea, her sister said. After asking to serve with the military in Eastern Ukraine, Vira said, her sister joined a volunteer group on the front line for two week-long periods during her time off from the military. Vira said that when her sister was captured, Nadiya was about to quit the military to join the volunteers full time. She said she has visited multiple European capitals in recent months in an effort to focus more attention on Nadiya’s situation. Her mother was in New York earlier in April and met with Samantha Power, the U.S. ambassador to the United Nations. “The international pressure is important so that the Kremlin understands that Ukraine isn’t alone and that the international community supports the position of Ukraine vis-à-vis the prisoners Russia is holding,” Vira said. Vira said she was pleased the EU Parliament approved a resolution calling for her sister’s release, and hopes other Western countries will do the same. The U.S. Senate passed a similar resolution earlier this year. She remains hopeful her sister could be released next month, when the Russian government plans an amnesty day. But Nadiya’s lawyer, Mark Feygin, has said he is preparing a case to have her identified as a prisoner of war – a strategy that could take several months, Vira said.